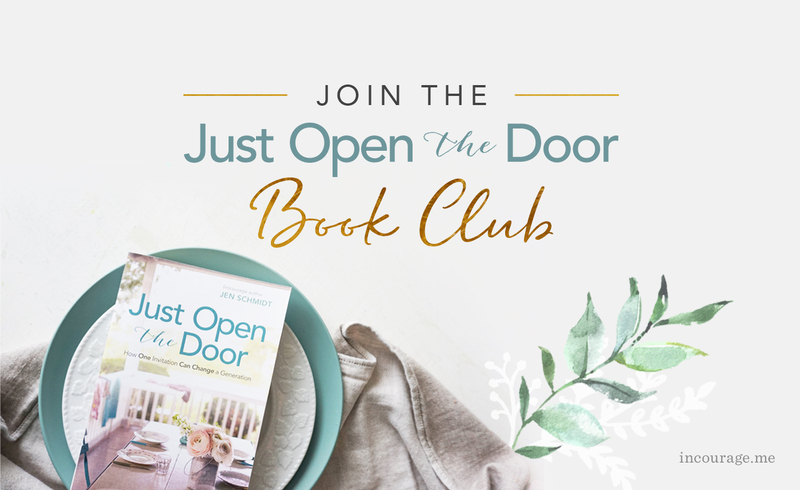 Click here to join our Just Open the Door Book Club Chat! That word can bring with it a whole lot of expectations and anxiety. Inviting people into your home might feel like inviting judgment on your entertaining skills and stress on your already maxed-out schedule. It might feel impossible or overwhelming to make food, clean the house, decorate, and facilitate conversation. 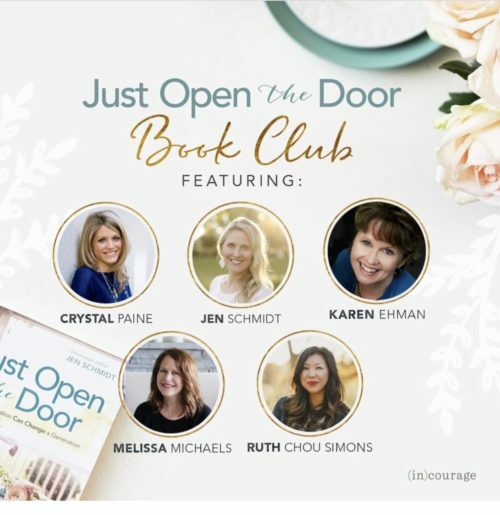 We’d love to invite you to join us as we kick off a book club featuring our new book — Just Open the Door: How One Invitation Can Change a Generation, by Jen Schmidt (that’s me)! 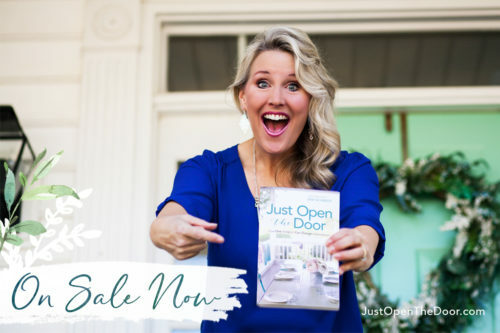 Grab your neighbors and girlfriends, or get a quiet moment by yourself, and tune in to listen to me and a few of my friends chat our way through the themes of Just Open the Door. For the next four weeks, we’ll share a Facebook Live video at 9 p.m. ET (8 p.m. CT/7 p.m. MT/6 p.m. PT) every Monday in our very own private Facebook group. Not on Facebook? Not to worry! We’ll email you the videos every week during the book club and they’ll also be in the Facebook group so you can watch them at any time and interact in the comments too for additional inspiration. I can’t wait for you to meet them! These are sweet friends of mine and some of our favorite writers and speakers. They live out biblical hospitality in their own lives, and we can’t wait to learn all their secrets! Whether you’re a seasoned host looking for renewed inspiration or a nervous newbie not sure where to begin, we will give you our best practical ideas that are easy for anyone to implement! You’ll come away with tools for simple food prep, cleaning made easy, creating a welcoming ambiance with what you already have, and guiding meaningful conversations without a ton of stress. If you don’t have the book yet, grab Just Open the Door: How One Invitation Can Change a Generation now so you can be all ready. The videos will be covering lots of information that’s not in the book too, so we will have lots of fun themes to chat about even if you haven’t read the book yet.